Print Medium retards the drying of System 3 Acrylic Colors on the screen, which reduces the risk of screen blocking, and makes the paint easier to wash out. The colors retain great density even after mixing with Print Medium. Very substantial covering power can be achieved on paper, card, and board without puckering or wrinkling. Print Medium can be diluted with water. 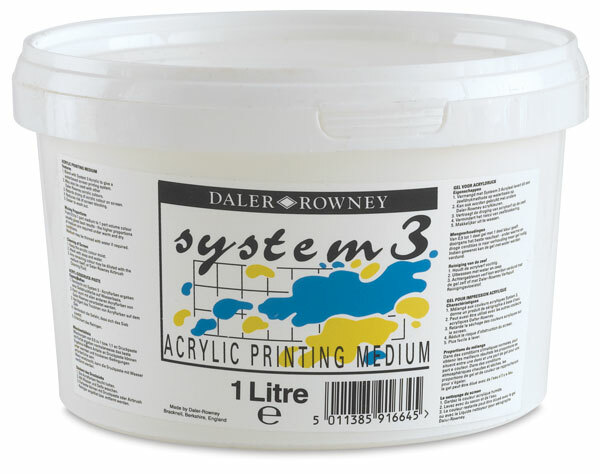 Use System 3 Acrylic Screen Printing Medium in conjunction with System 3 Acrylics for a safe, solvent-free alternative to traditional printmaking. System 3's rich pigmentation assures the strong, clear color definition demanded by professional printmakers. 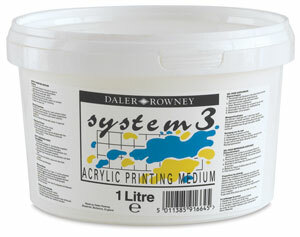 Daler Rowney's System 3 Acrylics and Mediums clean up with water.